The first step to healing from sciatica is understanding the underlying cause. Sciatica is not a true diagnosis but a symptom of several different conditions. Continue reading to learn more about sciatica, it’s causes and treatment options. 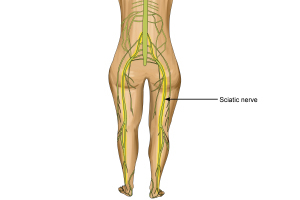 The sciatic nerve is the largest nerve in the human body; it runs from each side of the lower spine, down the buttock, back of the thigh and into the foot. Sciatica is not a true diagnosis but is actually a symptom that describes pain felt along the course of the sciatic nerve. When the sciatic nerve is irritated, symptoms may be experienced anywhere along the course of the nerve. This means that pain may be experienced in the lower back, buttock, back of the thigh, back of the leg or into the foot. Symptoms may also be described as: burning, numbness, tingling, pins and needles or cramping. Since the sciatic nerve supplies muscles in the lower limb people may also experience weakness or tension into these areas. 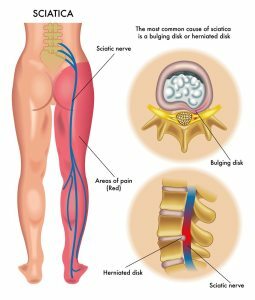 Sciatica occurs most often as a result of a disc injury which may be described as a disc herniation, disc bulge or disc derangement. When the disc is injured inflammation around the disc can irritate the sciatic nerve leading to sciatica. Learn more about disc derangement and disc herniation in the next blog post. Degenerative joint disease or osteoarthritis is an age related condition that can affect any joint in the body. 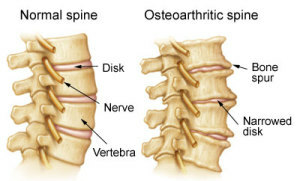 The spine is made up of vertebrae, which are connected to one another by facet joints. The joints allow for movement and stability of the spine. 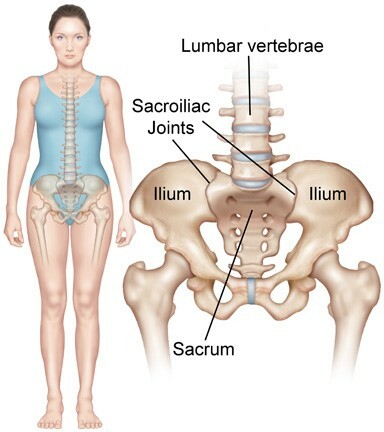 In a young healthy spine the facet joints are covered in cartilage and are well lubricated by fluid. All of the joints, including the facet joints, are susceptible to wear and tear, degeneration and inflammation. Over time the cartilage may start to wear down and spurs of new bone may form at the edge of the joints. The discs are cushion-like shock absorbers that lie between each vertebrae and are made up in large part by water. As we age the discs loose water and therefore thin and loose height. These changes narrow the space between the vertebrae where the nerves exit the spinal cord and branch to supply the limbs. 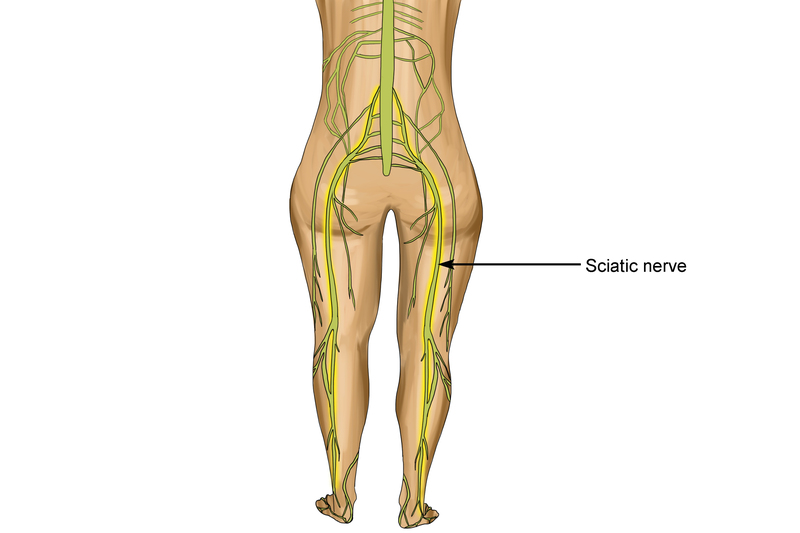 This narrowing can lead to inflammation and irritation of the sciatic nerve leading to sciatica/pain. This narrowing may also be referred to as lateral lumbar spinal stenosis. The piriformis muscle is a triangular muscle that runs from the side of the thigh and inserts onto the sacrum (the large triangular bone at the bottom of the pelvis). 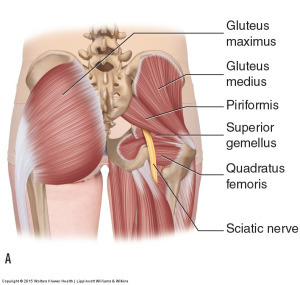 It is a deep muscle located underneath the gluteus maximus and in the majority of people the sciatic nerve runs underneath the piriformis muscle. In piriformis syndrome the sciatic nerve becomes irritated by tension in the muscle or due to direct trauma to the area. Newer research also suggests that the term deep gluteal syndrome is more appropriate because there are other structures in this area that can also create sciatica nerve irritation/entrapment. Fibrous bands, and tension in the gemelli muscles, obturator internus and hamstrings can also cause sciatica. Other conditions may also create symptoms that are similar to sciatica. Lumbar or sacroiliac joint irritation along with trigger points in the buttock muscles can create pain that may seem similar in character and location but are not truly sciatica. The chiropractors at Mountain Health & Performance treat all the conditions related to sciatica that is described above. If sciatica is caused by a disc herniation proper education, exercises and hands-on therapy will be prescribed. This may include: laser therapy, traction, mobilization, + rehabilitation. We also work closely with patient’s medical doctors to help manage severe pain related to disc herniation and sciatica. When sciatica is caused by joint or muscle related conditions manipulation, and myofascial release is an important part of removing tension or compression on the sciatic nerve. Exercises to strengthen the lower back, hips and core are a standard part of all of our patient’s treatment plans.